Last week in the clinic a 42 year old male patient suffering with pain on the lateral ankle following twisting it 4 months ago came to see us. An x-ray discovered an avulsion fracture to the base of the fifth metatarsal. 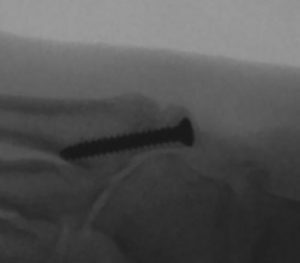 An ultrasound was then performed to assess the integrity of the peroneal brevis tendon at its attachment to the base of the aforementioned metatarsal, which appeared intact and normal. The outcome was that the patient was referred to a consultant for orthopaedic pinning of the fracture site.